When you're ready for an upgrade for Mac Os X 10.7? is a serious problem. We all now this operating system and it is painful not to use bryce. I'm quite sure Daz realizes just how big a problem this is, but an unfortunate and unavoidable chain of events led to Daz being without the right people to attempt to solve the problem with MAC. To the best of my knowledge that's been sufficiently corrected but these things operate on developement cycles and once a cycle starts if you get someone who can work on something not currently in the cycle, you don't just jump in. That probably sounds very frustrating to someone adversely effected by the current release but unfortunately that's just how things are done. The bigger issue is this though MAC has essentially taken things in a direction that can't be easily solved by slight adjustments to Bryce. In other words to really fix the problems and to keep them from continuing to happen, really requires a complete overhaul of Bryce. Unfortunately that costs lots of money and inspite of the number of people who this has become a serious problem for there really aren't that many people paying in for Bryce 7 Pro. Of course if the program is unusable for someone you can't really expect them to buy something else to use with that program. So it's a catch 22 because Daz needs to make more money off of Bryce to afford to really fix it but customers need it fixed before they'll spend money on it. There are ways around it though, there are people who have found a way to use it with Parallels to run Windows on their MAC and then successfully run Bryce that way. The only down side is you have to own a copy of Windows and Parallels which between the two is a fair chunk of money. They do offer a free trial though so at least you can make sure it works for you before you buy Parallels. Although you would still need a copy of windows too. I wonder how you workaround the material image loader bug which appears already with SnowLeopard? Unfortunately that costs lots of money and inspite of the number of people who this has become a serious problem for there really aren't that many people paying in for Bryce 7 Pro. Of course if the program is unusable for someone you can't really expect them to buy something else to use with that program. So it's a catch 22 because Daz needs to make more money off of Bryce to afford to really fix it but customers need it fixed before they'll spend money on it. What I don't really understand is why DAZ is offering Byce FREE (along with a couple of other DAZ apps) when it clearly (?) needs money to develop an OS 10.7+ compatible version. Seems like commercial stupidity to me. I appreciate the generous & unconventional philosophy of getting new users on board but DAZ has effectively shot themselves squarely in the foot by not only offering the app for free at a time when they need re-coding funds, but also by leaving the app up & available on the Mac App Store for a US$100 purchase price. I feel sorry for the few who purchased the app. via Mac App Store & have subsequently posted bad reviews. Obviously this is also bad for DAZ reputation & desperately needs fixing. 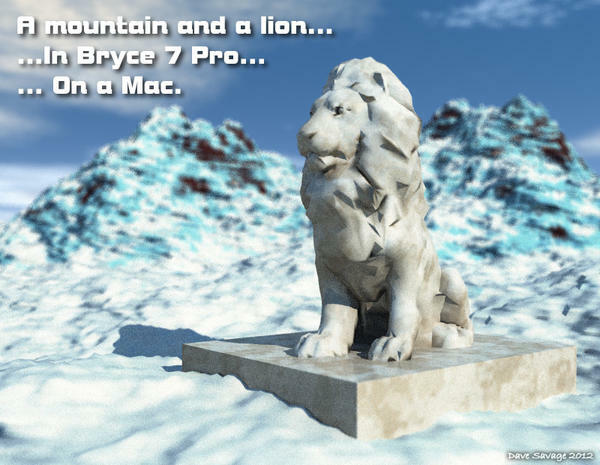 Please note that while "Bryce 7 Pro" is currently not compatible with Mac OS X Lion v10.7, we are working hard to resolve these issues as quickly as possible. Only the other day, I suggested a much cheaper way to be able to keep running Bryce. The more people who post to this Forum about the Mountain Lion problem the better. It might help highlight the problem to Mac users who are unaware that anything is wrong as Daz have done the minimum to point it out and if, like me, you buy a new Mac and try and use your old (paid for) application you don't know in advance anything might be wrong. Buying a second hand computer of unknown quality and having to run two systems is not a answer. The answer is for Daz to sort out the problem and the more people who point that out the better the chance that they will get the message. I encourage everyone effected to keep posting about this issue and those who it doesn't effect can just ignore the messages which is easy enough I would have thought. You did of course notice my post at the top of this thread, which links to a post by DAZ_BFurner, who is DAZ 3D management, Only DAZ 3D Employees post using a DAZ_Name. If you buy a new a computer with a new OS without first checking all your software is compatible, that is Daz's fault? really? I'm not saying that people shouldn't keep highlighting the problem and I agree that Daz really needs to address the issue, until they do, there are things you can do as well as complaining. I never said it was the answer, in fact I said it wasn't ideal... However, if people were willing (like me) to purchase Bryce 7Pro then, now it's free, it's no real gamble buying a £50 computer to run it on. As for the issue of "questionable quality", then you make sure you buy it from a reliable source. Even the most expensive G5 iMacs are selling for peanuts and for 3D Bryce hobbyists, it's an answer. For 3D professionals, if they are making enough money, they can easily buy a dedicated to Bryce PC if they really can't earn a living without Bryce. Or if they really can't stomach having to buy a PC, they can run it on a new Mac using Parallels or another Windows emulator. They already have the message. They have given statements saying that it will be a priority as soon as Bryce comes back into the Dev Cycle. However, you can not and should not rely (ever) on your favourite software continuing to be developed at all. Yes, if people keep using it and showing off the great artwork that can be produced with it, maybe more people will discover how great it is. Whinging about it on a forum where we already know how great it is, isn't going to do much. To that effect, I'd rather encourage people to find ways of getting around the problem rather than just to come here saying they are fed up that they can't use Bryce on their new Mac. It does effect me. But actually using Bryce is more important to me than having a excuse to complain on the internet. Well the reason for giving stuff away is to maybe get enough people interested in these products and also the money from sales of content for these products. When they had the price going for Bryce few people were buying it and I seriously doubt the core apps are where Daz's bread and butter are. I understand the point you're making about "why give up a revenue source when you need money". In the sales industry this is what as known as a loss leader, with the goal being to generate other sales because of the savings of the loss leader. I mean sure you can do plenty with just Bryce but if you're new to it, it doesn't seem that way. It would seem like all you can do is landscapes. So the average person is likely to say "Gee I just saved about $100 (US) so maybe I'll spend some of that on stuff to use with this program?" I do agree that Daz could have done more to bring to people's attention that it has issues with the latest Mac OS, as it stands now you can download the free app without seeing anything indicating compatibility issues. This is partly to blame on the site changes. With the old sites the compatability issue was highlighted in red on the product page. So you had to see the warning if you tried to put it in your shopping cart unless you didn't bother to read anything other then the add to cart button. As for the App Store I'm not a Mac user so I've never been there nor do I have any clue about who entries there are handled and by whom they are handled. Unfortunately in the fast paced ever changing technology world programs that you pay good money for are not guarenteed to always be updated. Sometimes it's just not practical. I'm not sure what the issue is with the latest Mac OS but I do know that Bryce in part at least is based on very old Mac programing code. As such it isn't a far fetched possibility that they might not be able to fix Bryce for Mac. If it turns out it needs to be completely rewritten then we might see Bryce become a PC only product. For now though and in the future if it does become PC only there are still solutions such as running Bryce on the latest Mac's using something like Parallels or Bootstrap. Others have already done so and reported that it works fine that way. The big issue there though is you would be forced to buy a copy of Windows and since many Mac users have a hatred for Windows that can be a problem for them. Plus admittedly it's a fairly expensive way to be able to run just one program most use as a hobby. I guess then it boils down to just how badly do you want to be able to use Bryce? The reality as I see it is the vast majority of customers at Bryce are not very talented with these programs and as such require people to make content that does much of the work for them. That model is not really well suited for Bryce though because there most of the folks passionate about Bryce are of the mindset that renders done with it should be pure Bryce which almost demands the user do most of the work themselves. Due to this the whole market for Bryce both PC and Mac isn't really significant enough to really put much pressue on Daz to focus more on Bryce. So until that changes it just makes smart business sense, even though it doesn't seem that way to us, for Daz to focus more on Studio, Carrara and content for Poser since that is where they get the most sales. Hopefully when they do get to work on it they'll be able to fix it so it does work on Mac OSX Lion and above but the real question for me would be how long before Mac makes other changes to their OS that breaks Bryce again. The problem wasn't that Daz broke Bryce for Mac's as it worked on the latest Mac OS when it was released. It was shortly after that though that Mac released it's new OS that did break it but unfortunately the contract for the person able to fix things had expired by then and that person moved on. Now I know alot of people scoff at the idea that Daz had just one guy able to potentially fix things but that's because the coding skills/knowledge needed is outdated and so there aren't a whole lot of folks up to the task of developing Bryce for Mac and the ones that are are in high demand and demand lots of money as a result. People need to keep in mind that Bryce was aquired by Daz not created. I would imagine at the time Daz felt they could keep it going for a good while without needing to rewrite the whole thing? I also would imagine that if they had a crystal ball and could foresee who quickly that would become untrue, they might have decided against aquiring it in the first place. Bryce is unlike anything out there even though there are other apps that do similar things. Daz is great at content but I've yet to see evidence that they are capable of building revolutionary software from the ground up. I mean if you look at the troubles they've had with the one App that is their creation, Studio, it's pretty clear that their area of expertise is not apps but rather content. Daz is aware of the problem but like I said in the post above the Bryce market is just too small, so you're not going to see unhappy users force things the way windows users did when Microsoft wanted to abandon XP several years ago and force people to Vista. The one thing I wonder about though is this, I know Bryce 7 Pro is broken for Mac but what about the older versions? I've yet to see anyone say that they couldn't run the older versions on their Macs. They might not be able to but if so nobody I've seen has mentioned it. So if it isn't that brings up the simple question of why not go back to the older versions of Bryce? Bryce 7 Pro has been broken for Mac about as long as it has been around, so there can't be that many people who are lost without the newer features of Bryce 7 Pro besides many of the features that sets Bryce 7 Pro apart from older versions don't really work that well..
As I understand it, the code base that no longer works on Macs goes way back. Ah so the only way then would be to use an older Mac still running an older version of it's OS? Or to put it another way you can't dual partition a Mac and run different versions of an OS like you can with a pc? So it's a hardwired problem in the hardware of newer Macs? I mean it just dowsn't make sense to me. I mean I can run Bryce 5 - 7 on this PC although the technology in it is way advanced as is the software compared to what was current when those versions were new. So why can't a current Mac OS on the newer Macs run say Bryce 6 or Bryce 5.5? I have only second hand knowledge of Macs or anything Apple for that matter so forgive me if there is a common know reason why it can't or how it's really Daz's fault Bryce doesn't work then? I mean if it's broken for all Bryce versions because of code that's always existed up to now then surely protests about it would be better directed at Apple? Surely Bryce wasn't the only program affected by the change? I think incompatability with older software was one of the core issues the people that got Microsoft to keep supporting XP until they produced something better then Vista? So maybe all the unsatisfied Bryce/Mac OSX Lion and above users out to petition Apple rather then Daz? I'm just saying. Apple have made it impossible to run their own old os on newer macs. You can partition the hd, but you can NOT put Snow Leopard on it. You have to use Windows 7. If it wasn't so stupid I'd allmost laugh. But it maks me angry actually, not beeing able to use Bryce on my mac because Apple want to be soooo special. Thanks for your comment, it's encouraging to see that some Mac users are reasonable enough to recognize where the cause of the problem truely is. So I take it by your comment then that what FixmypcMike has said about this code issue going way back does in fact mean that OSX Lion is unable to run older versions of Bryce, without crashing, as well? Macs used another (Motorola) processor family than PCs (Intel) do. At one time, Apple abandoned Motorola and switched to Intel. Code written for the earlier processor family is not compatible with the one used now. Macs featured a virtual processor that made applications programmed for the previous processor run on the new. Apple had announced that they will stop supporting programs written for the previous processor eventually. It appears that nobody believed that this would be done with a dot-update (10.6 to 10.7) but rather with a full update, like 10.x to 11. However, Apple chose to dump the support for the old programs earlier. In fact, a few months after Bryce 7.1 came out, which is most unfortunate for the Bryce community on the Mac. Windows emulators on the Mac still support programs written for the old processor, and of course for the new one, which is the same Windows uses. We can argue whether it was a good move to stop support for the old programs for good or not. Programs I've written for DOS in 1994 still run on Windows 8, which I find very cool. On the other hand, dragging on old code just to keep outdated programs along is also a hindrance to progress and makes the operating system bulkier than necessary - and progressively more difficult to maintain. What this boils down to is that Bryce for the Mac has to be re-written in very large parts. But then, to make Bryce a 64 bit application for the PC does ask for exactly the same. It is time to rework Bryce from the ground up; it doesn't work on the Mac and is crippled on the PC. If DAZ 3D doesn't or cannot bring the code base up to date for whatever reason in the near future, Bryce ought to be given to a company that is prepared to do this time consuming and expensive task. Otherwise, Bryce will perish. Well that fills in the blanks a little better, thanks Horo. Well to the point of what Daz should do with Bryce, I've not seen any indication from them that they're unwilling or unable to upgrade Bryce, just that they can't do it right now. I agree that if they decide to give up on it they should hand it over to someone else, assuming there is someone else interested and capable in taking it over. For now though I think Daz deserves a chance to go thru at least one more dev cycle with it. Afterall they did really make some significant improvements to Bryce even if it did take you and David a while to really figure out how to exploit them to their fullest potential. As for a total or near total rewrite I'm inclined to think that wouldn't go well unless Daz somehow managed to get the original creators involved. Left to others only using the old versions as a guide leaves me feeling like it wouldn't go well. I would love to see DAZ 3D start a new dev cycle. There are outstanding programmers out there, we had the chance to work partly directly with some of them and they did an amazing job. DAZ 3D had an excellent feeling to whom most of the work was outsourced to. We had a lead programmer (Bryce 2 to 5) for the 6.0 to 6.1 dev cycle and he was excellent, too, but not better than the "newcomers". This makes it appear that a really good programmer understands the code and/or that the code is well documented. A part of the 5.5 to 6.0 dev cycle was also outsourced and a very good job was done, just not so amazingly outstanding as what we've seen for 6.1 to 6.3 to 7.0 to 7.1. Knowing the whole history would certainly be helpful, dedication seems to count more, though. It was planned to make Bryce a 64 bit application from 6.3 to 7.0 (that's why I had invested in a new computer) but the task turned out to be rather daunting and beyond the initial budget planned. On the other hand, we got so many new and enhanced options (and a very few frustrating bugs) that haven't even been detected, let alone exploited, by most Bryce users. We haven't a lot to complain about, really - except the Mac community. The last dev cycle took 2 full years and we have had a standstill for less than 15 month. We just cannot say honestly that DAZ 3D hasn't done much for Bryce. Nevertheless, time moves on and so must a program. I can´t believe that DAZ 3D just bought Bryce to let it die, is a real shame and a real disappointment, you have to make a Bryce version that runs on Mac OS X Mountain Lion. PLEASE PLEASE PLEASE, you can not let an amazing tool and a legend like Bryce die. I propose to set up a http://www.kickstarter.com project to gather money to support Daz 3D on the creation of a 64Bit version of Bryce for Windows and Mac. Please don´t let it die.